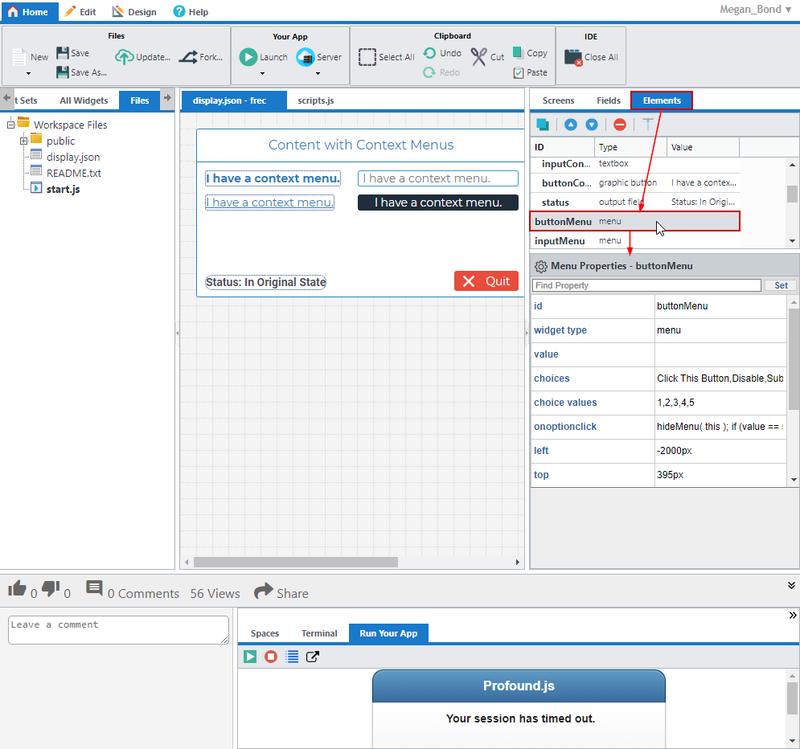 Some Profound UI users would prefer to replace information anchored to the screen with a popup context menu, but linking the popup to the anchored text so that the user can use the function buttons can be tricky, especially when you have multiple lines of data. Below is a context menu specific example of our Profound Pro Tip: Creating Custom Tool Tips. First, you’ll want to set up your screen. 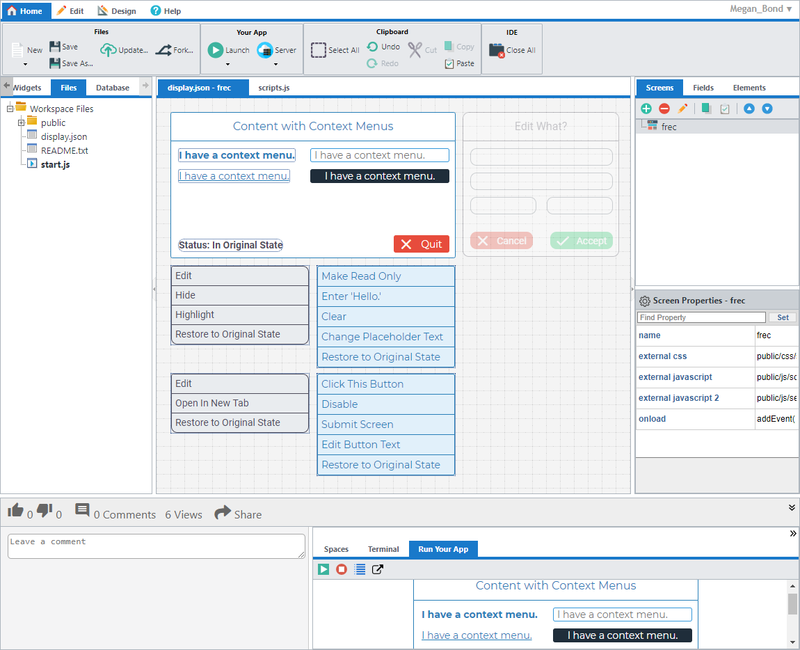 In the screenshot below, you can see that we have some content and some menus to be the context menus of that content. The four widgets with the text “I have a context menu.” will be the ones getting the menus in this example. 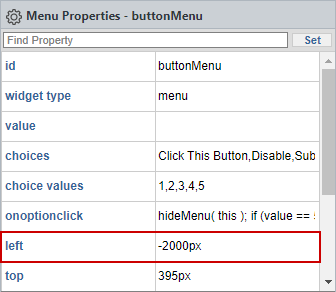 preventEvent(); // Prevent default context menu from popping up for all elements on screen. In the above code, you can see that the addEvent() (http://www.profoundlogic.com/docs/pages/viewpage.action?pageId=3276841) and preventEvent() (http://www.profoundlogic.com/docs/pages/viewpage.action?pageId=3276831) APIs are used to prevent the default context menu from popping up. These are Profound UI APIs. To learn more about them, please check out their documentation pages. 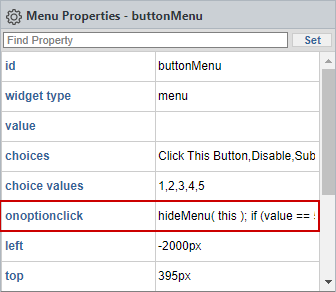 And the code below is used to hide the menu when an option is clicked, or the mouse leaves the menu. We have several widgets needing the same code. Instead of wasting all the effort adding this code to each of the elements, making the code harder to maintain, let’s make a function that we can call instead. Below are the functions I came up with for this example, but there are plenty more approaches to this. // For Gecko (Firefox), WebKit (Safari/Chrome) & Opera, was the object right-clicked? 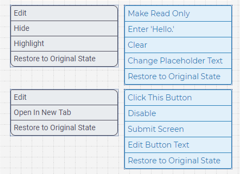 // For IE & Opera, was the object right-clicked? // If the object was right-clicked, show the menu. // Else, hide the menu. // Move the menu to the cursor’s position. // over one of the options. // This is the original element the event handler was assigned to. // The mouse left the menu, hide it. // "menuID" is replaced with the corresponding menu's id. // "textMenu", "inputMenu", "linkMenu", and "buttonMenu". // ‘this’ will be referencing the menu object. // An option was selected, hide the menu. Now the menus pop up and hide as you interact with the widgets, but all of the context menus are visible when the page loads. All you need to do to fix this is set the left property of the menus to -2000px. This will move them off screen and out of sight until the proper event shows them. Now that the menus are off screen, they are also off screen in the designer. You can use the Elements tab of the Screens panel to continue to work with them if you need too.